We departed the Fort Lauderdale airport for Chicago with our undeclared cargo of four Black Swallowtail Butterfly larvae safely encased in a plastic bag with a generous bunch of fresh parsley. We were uncertain as to whether Homeland Security might regard them as “liquids or gels” that required special attention. See earlier post about how we met the parsley caterpillars. We got through security, and three of the four made the journey without incident. The smallest caterpillar had fallen on the floor when I was transferring them, and I had to pick it up with my fingers, probably causing an injury. It failed to thrive, and expired after a few days. The other three caterpillars quickly formed chrysalises, which I hung from a banana hook in our kitchen. 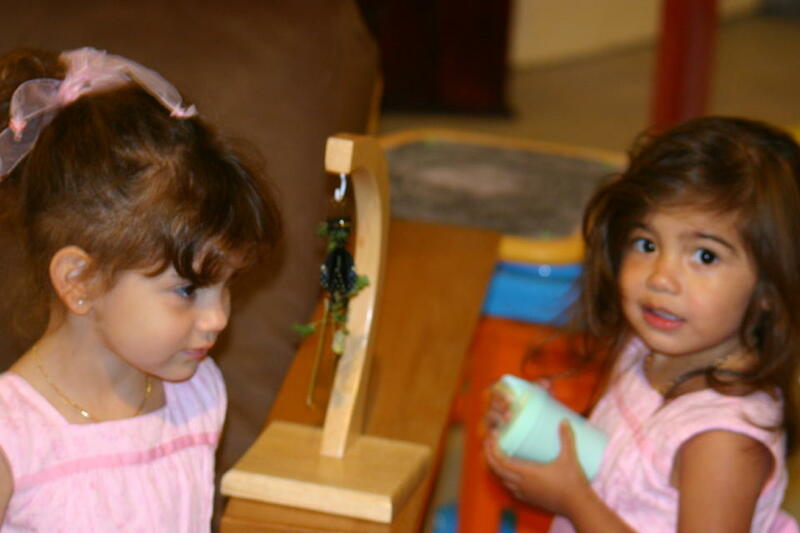 I wanted the grandchildren to experience the thrill of seeing them turn into butterflies, so I brought them over to their home when the first appeared “ripe,” as evidenced by its darker color and spotted pattern showing through the skin of the chrysalis. Sure enough, it emerged the next morning. Because of injudicious handling, its wings never opened fully, and we released it in a patch of Queen Anne’s lace (a Black Swallowtail host plant, as are all members of the carrot/parsley family) in the back yard, hoping it might still find a mate. The next one provided quite a show. The children had been watching it carefully, and saw it emerge. This time they knew to just leave it alone and let it complete its transformation without any “help.” We got there a little later and took a few pictures as it clung to the dried parsley stalk along with two empty shells and the third, still developing chrysalis. fluid into its wings as they expanded. 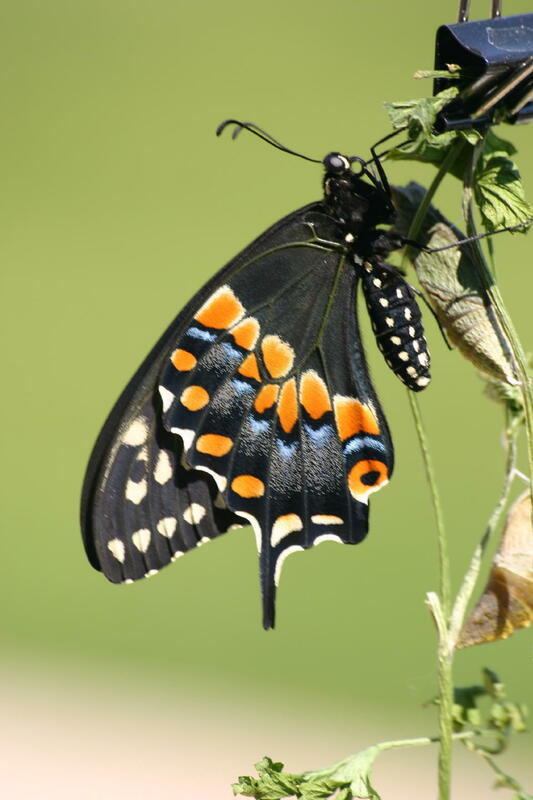 When it appeared that the Black Swallowtail was about ready to fly off, we brought it outside. 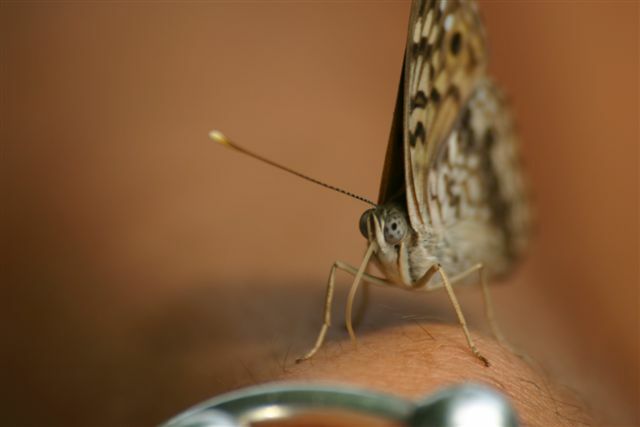 they watched the butterfly fly directly into the blue sky. Here in Chicagoland, Black Swallowtails are now scarce, but only yesterday, I saw one visit the Queen Anne’s Lace in the prairie just outside their back yard fence. 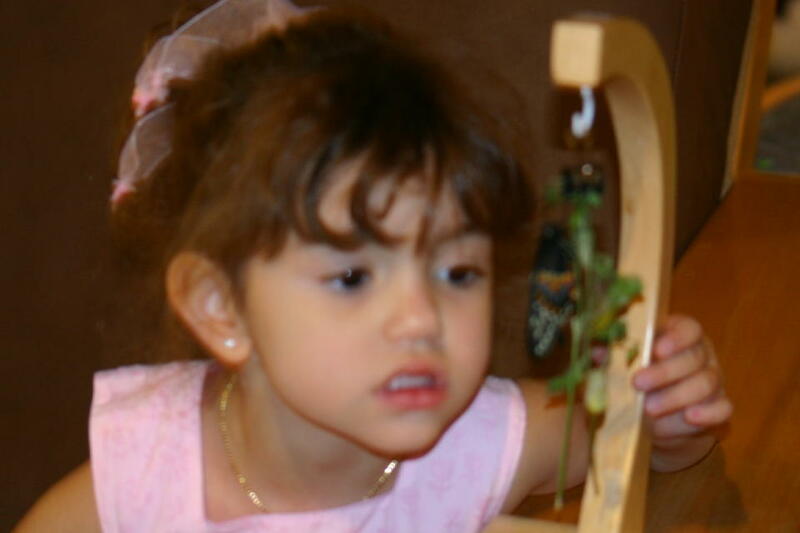 Could it have been “our” butterfly? 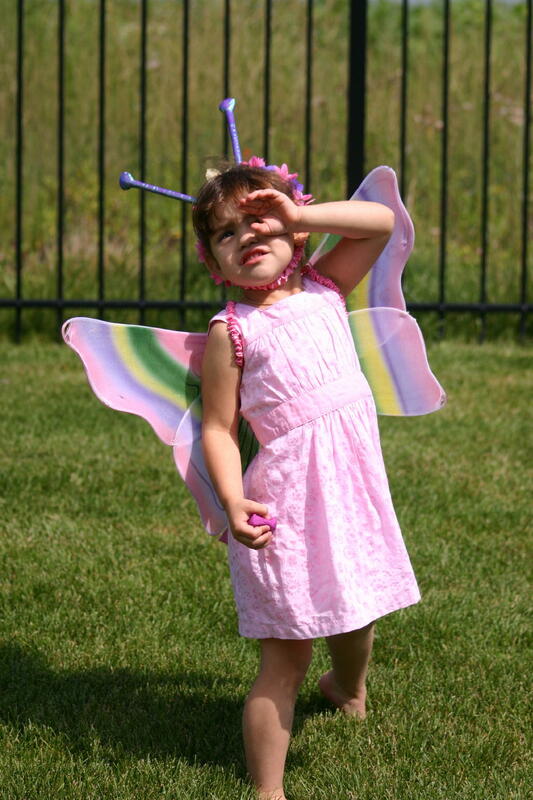 Did it find our little disabled flutterer? Interestingly, the final caterpillar’s chrysalis has not yet opened after almost a month. 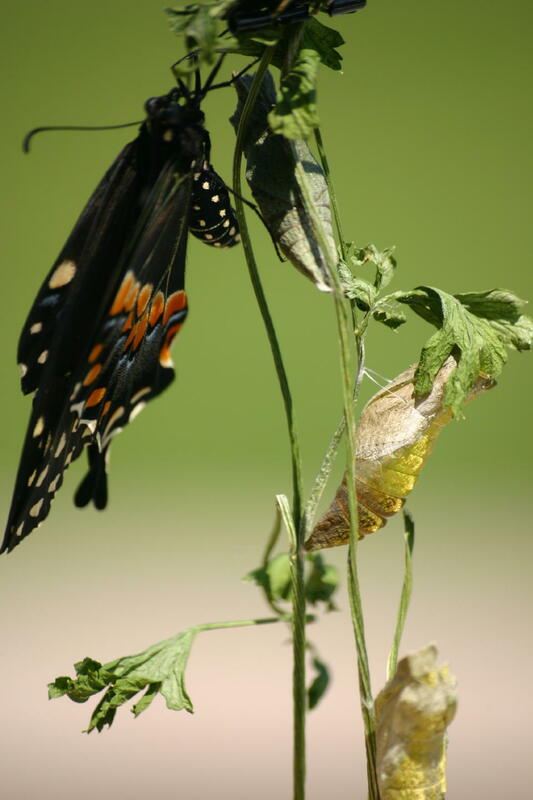 Since Black Swallowtails overwinter inside the chrysalis, perhaps something triggered it to go into a dormant state. We decided to spend most of this summer at our condo up north in Chicagoland, away from the heat and hurricanes of South Florida. Well, there have been no hurricanes here, but so far the Sunshine State has also been spared. As for heat, we met or exceeded the highs back home for much of early August. There have been a few delightful mornings, just right for birding and nature photography. Last week, we took two of our granddaughters to a place with a very catchy name, Tekawitha Woods, a Kane County Forest Preserve. Except for the presence of exotic European Oak Leaf Gall Mites that produced troublesome itches, the children enjoyed exploring the edges of the paths for all sorts of insects. 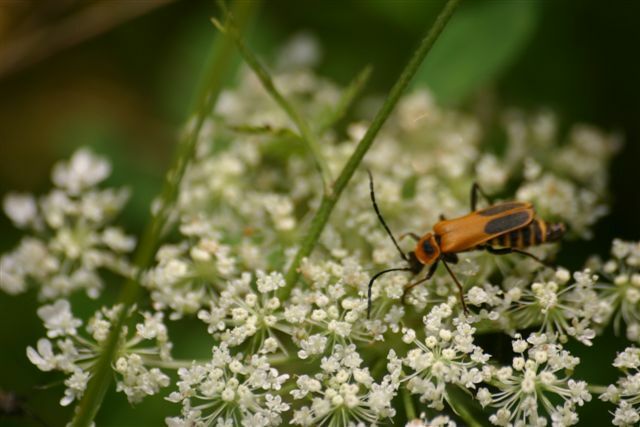 The beetle pictured above, on Queen Anne’s Lace, appears to be a longhorn beetle (species not certain, genus Typocerus) that mimics the coloration of wasps and bees as a protective mechanism. 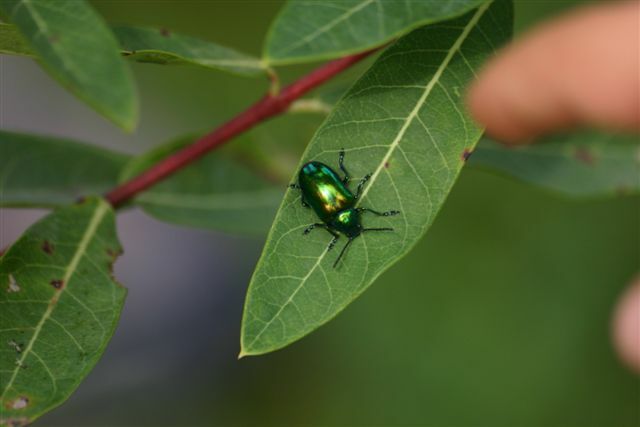 A brilliant green Dogbane Beetle attracted a lot of attention. 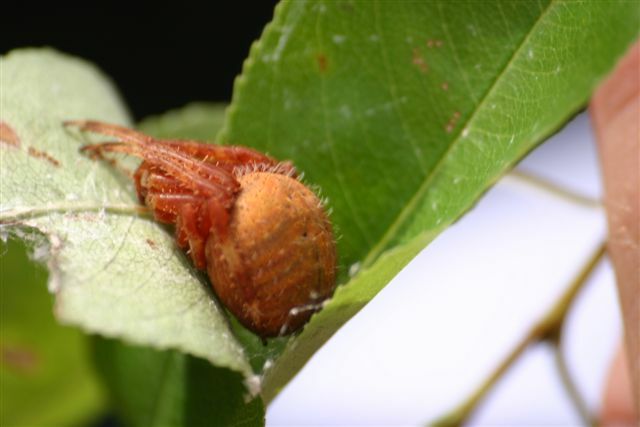 Naturally, it was chewing on a Dogbane leaf. 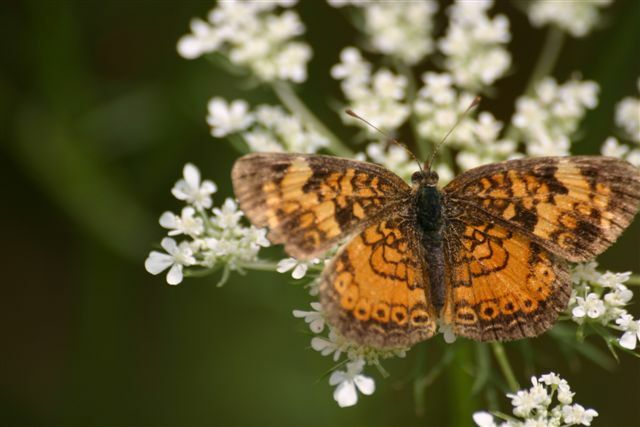 The Queen Anne’s Lace also attracted this Pearl Crescent (Phyciodes tharos) [misidentified by the interpreter as a Hackberry Emperor– thanks to an alert reader for the correction] which then took a liking to one of the mothers on the walk, sipping salty perspiration from her wrist. Note how its proboscis is extended. Spiders were much in evidence. 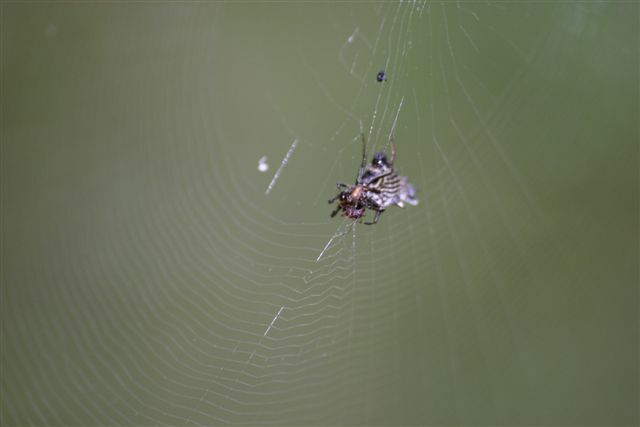 In the wooded areas, a variety of orb weavers elicited great interest from the children, who took turns observing their webs. 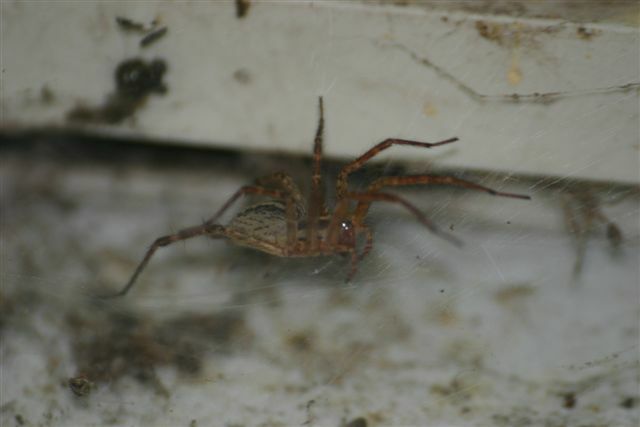 Back at the interpretive center, we got good looks a several grass spiders, whose webs are funnel-shaped and not sticky. They frequent man-made structures such as window frames. 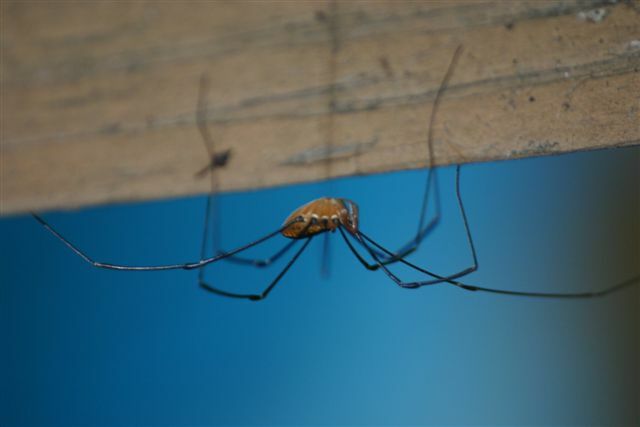 This Harvestman (“Daddy Long Legs”), hanging upside down from the railing at the entrance of the interpretive center, is an Opilionid, actually a relative of the spiders, whose eight legs emerge from its single body segment. 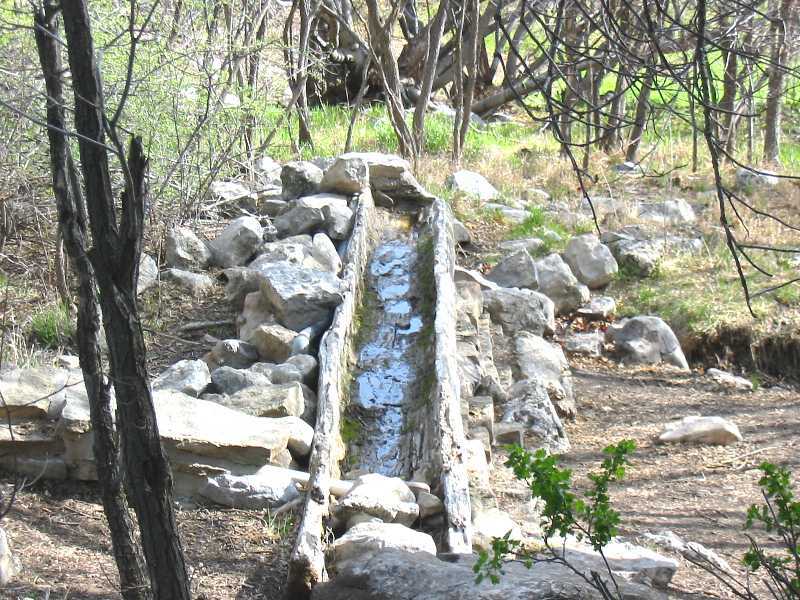 There is a special place at 8600 feet elevation in the Sandia Mountains just east of Albuquerque. I took the above photo one morning in early May of 2003. Sunlight dappled through the leaves of the large Rocky Mountain Maples that thrived in the moist runoff of Capulin Spring. 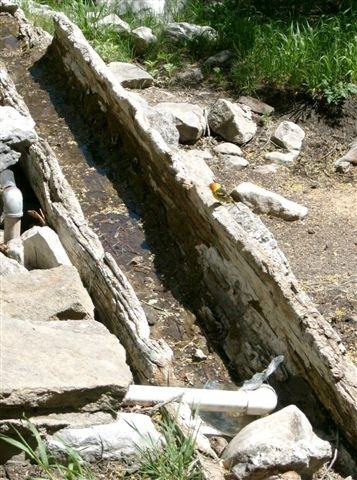 Water from the spring flowed through a pipe and was diverted into a trough formed by an ancient hollow log. 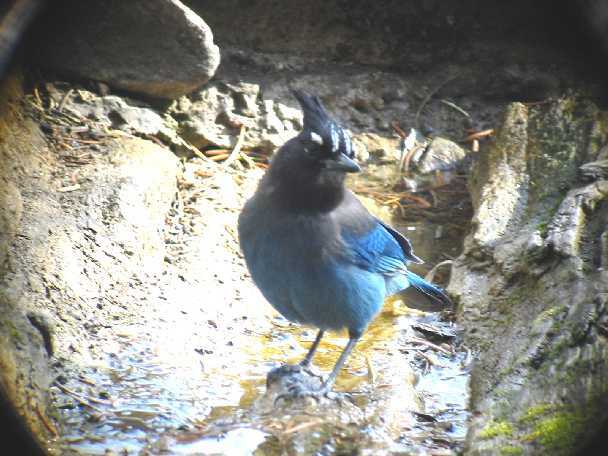 Water is scarce in the mountains, and the “Bird Log,” as it is called, attracts most of the creatures that call the mountain their home. One needs only find a comfortable place to sit and simply wait for the birds to come in to drink and bathe. 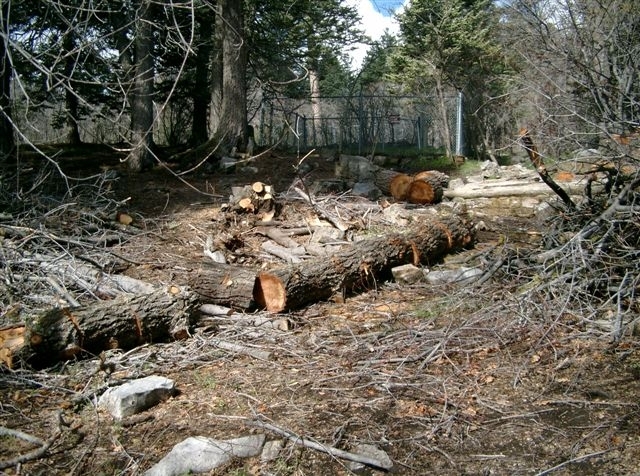 The log is especially popular with birds and birders during spring and fall migration. Even when we arrived early, we often found fellow birders already set up with cushions and binoculars. 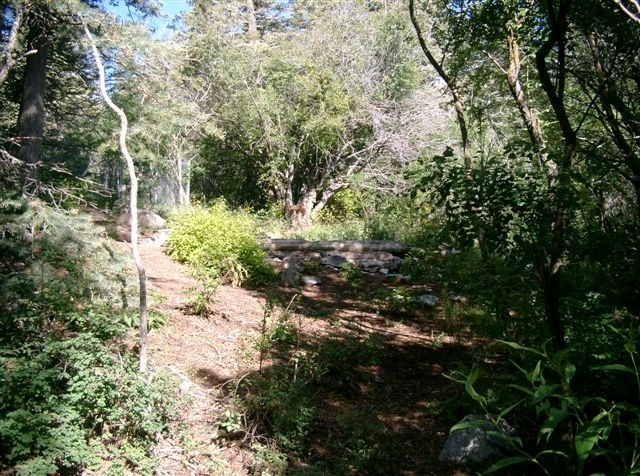 Birders sometimes gain a sense of “ownership” of such a special place, forgetting that the National Forest actually belongs to everyone. One day a young lady bushwhacked up the hill to the log and propped her back against the log to write (poetry or a love letter?) and enjoy the sounds and sights of nature. She was seemingly unaware of our presence or that she had interrupted our viewing of Western Tanagers, Black-headed Grosbeaks and an assortment of warblers and woodpeckers. Like the thirsty birds, we had to wait for her departure or simply find better hunting grounds. Nature has wondrous healing powers, and birders were pleased to see how rapidly the saplings invaded the area. Shoots from the old Rocky Mountain Maple that shaded the log (its stump can be seen behind the log in the photo below) are reaching skyward.